I found this quote on Pinterest and it completely resonated with me. Being a parent is being there through tantrums, the milestones and the tears. Being a parent means you love that little person which you created, more than you could ever love yourself or anyone else! You’d readily lose sleep to comfort them from their nightmares. You would risk your own life for that small person, you’d surely die to save them if you needed to. Being a parent is NEVER a burden, it’s loving somebody else wholeheartedly and unconditionally, for eternity! Being a parent to your child is NOT a job, it’s a privilege, cherish it. Thank you for sharing! I love wearing Mommy and me outfits with my daughter. I’m definitely considering purchasing matching swimsuits for the summer! You both are so cute. Love that quote – thank you for sharing it! I am due in 4 weeks and I cannot wait to hold my baby girl! You inspired me so much over the years, Annie, and seeing you and little Milan made me wish someday I will be just like you two! Annie, you are beautiful and strong, and Milan is so lucky to have you. I’m not quite sure what’s been plaguing you and I don’t like to make assumptions, but just remember that you got to keep the best part of him, which is little Milan. You guys are so cute! I love these mommy and me post! 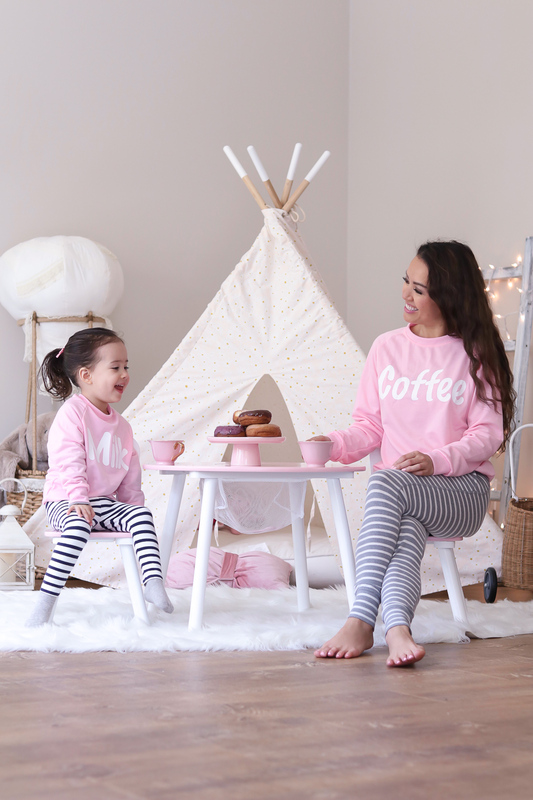 I am jealy that there are so much more cute matching outfits for mamas and little girls. How amazing are those swimsuits?! Wishing you a beautiful weekend. Being a mother means that you are excited when you and your three daughters wear the same size shoe. Being a mother means that you laugh, instead of fume, when you see a picture of your daughter’s friend on Instagram, at college three states away, wearing your favorite sandals, the ones you bought at Selfridge’s.